The Church of St. Sulpice in Paris, where the Da Vinci Code movie was filmed, was set on fire just after midday mass this past Sunday, Le Parisien reports. Firefighters and police said the blaze was an arson attack. 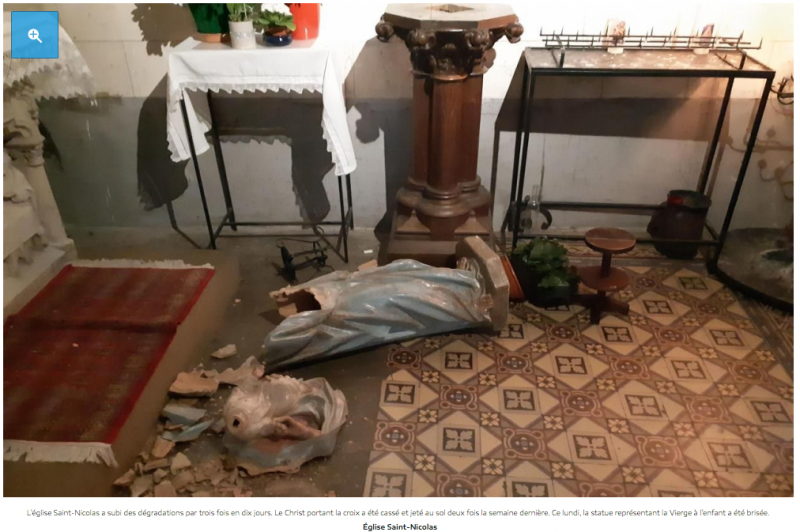 Aleteia There were almost 50 attacks and acts of vandalism against religious sites in France documented in the month of February, according to Observatory on Intolerance and Discrimination against Christians in Europe. One of the worst occurred at the historic Basilica of Saint-Denis, just north of Paris. Someone entered the Gothic church, where French monarchs are buried, smashed a historic stained-glass window, and wrecked the organ and choir-stalls. 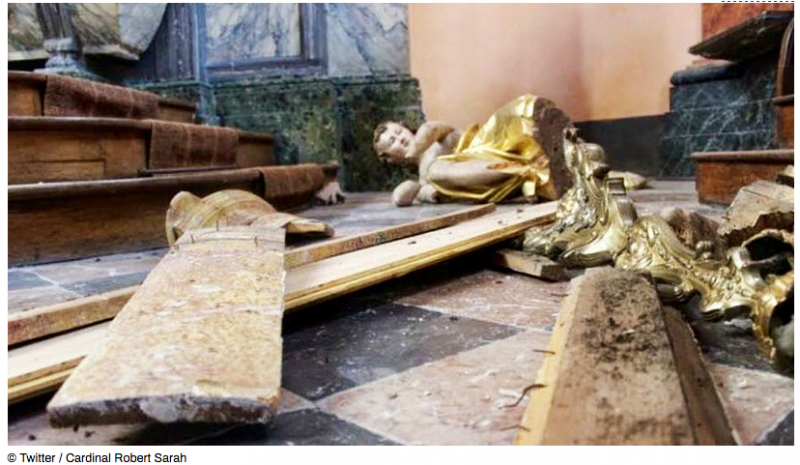 In February, a 19th century statue of the Virgin Mary was smashed at the St. Nicholas Catholic Church in Houilles. The statue was “completely pulverized,”Father Francois-Laurent Heart said. “It is irreparable.”The church reported three incidents in 10 days, with a cross also thrown on the floor by vandals. 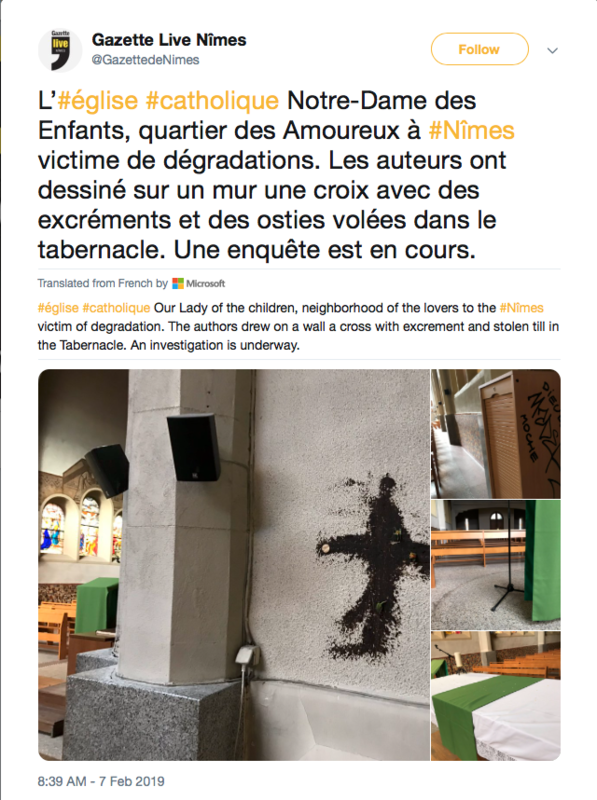 In Nimes, at the Church of Notre-Dame des Enfants, a cross was drawn on a wall with excrement, and pieces of consecrated Communion Hosts were stuck onto it. The tabernacle was broken and other consecrated hosts were destroyed in the February 5 action. At Saint-Alain Cathedral in Lavaur, statues and crosses were smashed and an altar cloth was burned in February. 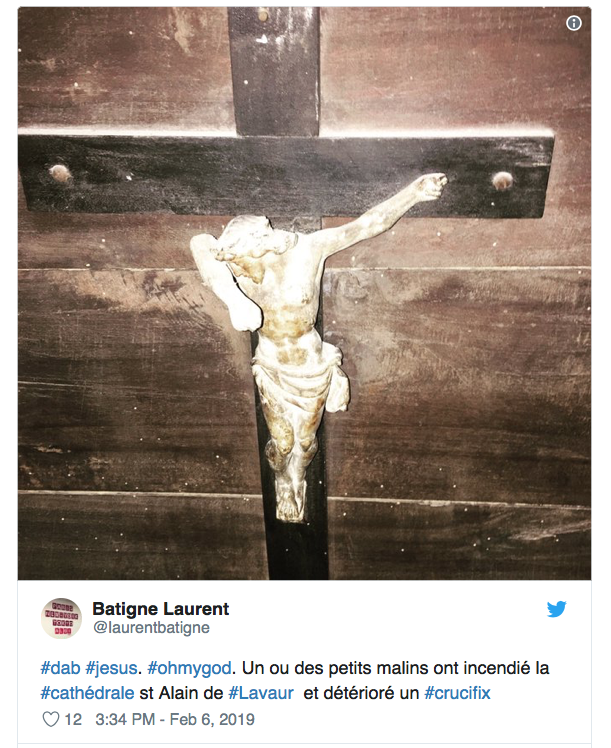 A statue of Christ on a cross was also interfered with, as vandals twisted one of the arms to make it appear that Jesus was dabbing, La Depeche reports. 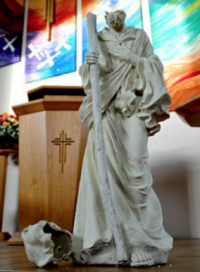 On February 23, the bas-relief on the altar of the Saint-Gilles church in Saint-Gilles-Croix-de-Vie was vandalized, with the Christ figure beheaded, the Observatory reported, saying it was the most recent incident in a series of attacks on churches in the Vendée region. “Although the motives aren’t always known, many are clearly aimed against Catholics,” said Fantini. The Observatory listed over 500 “brutal attacks” and discriminatory acts against Christians in Europe in a 2018 report. 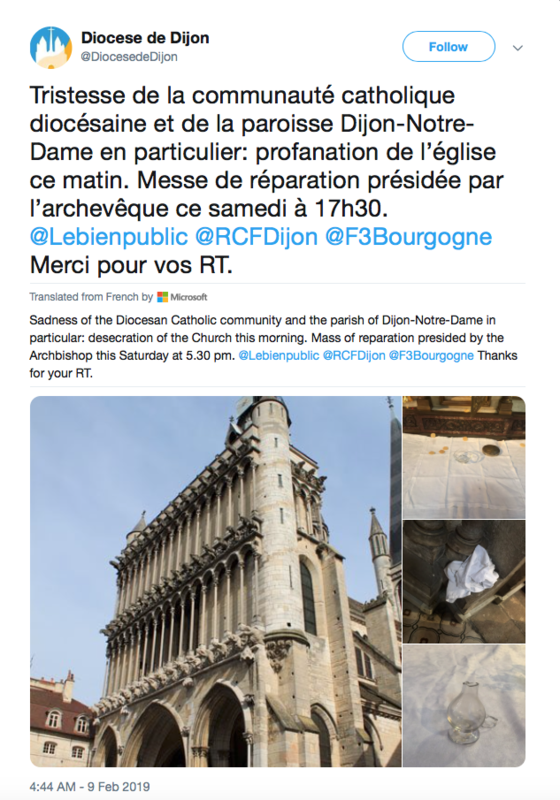 There is not much information on who might be behind the attacks, but a 35 year-old man has confessed to police that he carried out a February 10 attack at St. Nicholas Church in Houilles, Yvelines, throwing the tabernacle to the ground. And how could we talk about church vandalism in France without remembering the French priest Father Jacques Hamel who was savagely beheaded by Muslim terrorists in 2016? “In 2018, the Ministry of the Interior recorded 541 anti-Semitic acts, 100 anti-Muslim acts, and 1063 anti-Christian acts”. Among the 100 anti-muslime acts, I wonder how many are fake? I’d like to see every mosque in European countries razed to the ground, and the churches restored to their former glory. This is a deliberate attempt by the muslime vermin to eradicate our heritage and culture and replace it with their unique brand of savagery and depravity. After smashing the mosques to smithereens, we should smother the remains with pig fat and blood. That’d teach the scum for smearing excrement on our churches! If an immigrant is “ very poor and has no skills” and there for if that immigrant chooses to live in a lu try, that country MUST provide for them at all levels, house them , feed them , provide medical care for them…..my question is WHY THE HELL ARE THOSE IMMIGRANTS ALLOWED INTO THE COUNTRY! An immigrant should not be accepted if they have no skills…..and that state is going to have to provide for them at all levels! And we know that they won’t ingegrate and even try to help themselves, as we know moslems do….that’s not profiling, it’s fact. And that traitor French woman who converted,and is married to an iman ,,,” mother of 7 “! OMG! Seven children! Is there any doubt that Islam will out breed us!? Here Muslims in France harass a 5 year old Chinese girl. This is disgusting. The leftwing dictator of Venezuela promised to Turkey’s FM to convert to islam. Muslims can do whatever they want whenever they want. I truly hate them and the politicians who kiss their asses. I’m so sick of Mus lims complaining about descrimination when they know their only purpose is to destroy everything they come across to turn it into the same sh*thole they’ve turned everything else into. That said, I’m surprise the man is talking about France being a Christian country; considering that Macron says it’s treasonous to be Nationalist. How come old matey Muslim hugging footwashing pedo Pope hasn’t been vocal about his flock in France being terrorised by his Muslim chums? How come 5 mosques in Birmingham getting a few windows broken gets global coverage and is more newsworthy than mass dessicration of French churches? In the video about Jacques Hamel it mentions the attackers shouted “Islamist slogans”. The only thing they’d have been shouting is Allah Akbar – their victory war cry broadcast across new Zealand by the latest convert to Islam. A sad day in history, not because Muslims got shot that happens every day, and Muslims place no value on life. But because the hysterical response from the West accelerated their conquest at least 10 years. The West get outplayed every single day by Muslims. The msm here is quiet except for me slums complaining about (phony) harassment by infidels. Me slums are organized, very persistant and winning by calling the WH, congress and senate daily and while the bull crap group cair, etc., funded by me slum b’hood, fighting for them. It is time for us to organize and do the same thing! Otherwise, we are about to lose our country, just like France, Germany, Sweden, etc. On a sidenote: sorry to have to say this, Q followers, but Q uses hypnotic language. And when the number of “sealed indictments” gets to 1,000,000, well, that is just ridiculous. John Haller, a lawyer on u tube looked into it and it is rubbish – there is nothing like that many sealed indictments out there. People have been lulled to sleep by Q and are not protesting and fighting like they would be without Q. Stop “sit(ting) back and enjoy(ing) the show” – it is time to do something, like calling or emailing the WH daily, for starters. It is time to WAKE UP! Cameras should be set up, police protection or security guards for these magnificent churches of God! God is under attack in Europe from the Muslims!